Why include risk analysis in CAPA programs? How do we do RCA? What is a suitable basis for comparison? It is critical to determine the whys? 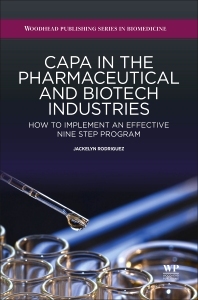 CAPA in the Pharmaceutical and Biotech Industries: How to Implement an Effective Nine Step Program contains the most current information on how to implement, develop, and maintain an effective Corrective Action and Preventive Action (CAPA) and investigation program using a nine step closed-loop process approach for medical devices and pharmaceutical and biologic manufacturers, as well as any anyone who has to maintain a quality system.This book addresses how companies often make the mistake of fixing problems in their processes by revising procedures or, more commonly, by retraining employees that may or may not have caused the problem. This event-focused fix leads to the false assumption that the errors have been eradicated and will be prevented in the future. The reality is that the causes of the failure were never actually determined, therefore the same problem will recur over and over. CAPA is a complete system that collects information regarding existing and potential quality problems. It analyzes and investigates the issues to identify the root cause of nonconformities. It is not just a quick-fix, simple approach, it is a process and has to be understood throughout organizations. Jackelyn Rodriguez has over 28 years of experience that cover all facets of quality assurance and regulatory compliance. Ms Rodriguez is the President of Monarch Quality Systems Solutions, a consulting firm serving in the technical and regulatory compliance capacity for several Pharmaceutical, Biologics and Medical Device manufacturers. Her consulting activities place emphasis on all aspects of regulatory compliance, training, Mock FDA audits/assessments, regulatory affairs and various FDA-related activities. Ms Rodriguez has published numerous compliance-related articles and has been a global industry speaker and presenter on several compliance topics. Her wide-ranged experience and recognized expertise in these areas have acquired her guest speaker positions worldwide. She has worked closely with CDRH’s FDA HACCP team for both promotion of Risk Management, training of over 1000 individuals, and worked with the FDA in their pilot study created to introduce the new Hazardous Analysis and Critical Control Points (HACCP) Inspection Technique to the Medical Device Industry.